Hey all homeowners, are you renovating your bathroom, kitchen or looking to revamp bathroom wares & fittings, wait no longer! 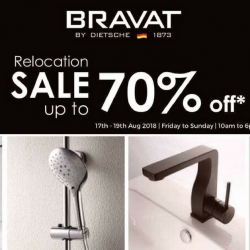 Bravat Singapore is having its Relocation Sale with up to 70% off ~! Get your quality basins, shower heads, bathtubs and sanitary wares from this German brand!